De Jordaan is a neighbourhood in Amsterdam dating back to the 17th Century. The name De Jordaan comes from the French “jardin” which literally means garden. With its location only a 10 minute walk from Amsterdam Central Station, De Jordaan has become popular with tourists and has always been popular with locals. The neighbourhood was populated mainly with immigrants in the affluent industrial era. De Jordaan was vastly overcrowded at this time and living conditions were very poor, today there are around 20,000 people reside in De Jordaan and conditions have far improved. The architecture is typical of its time, small streets, narrow houses, and an infrastructure of canals. 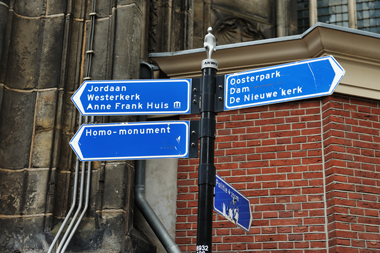 De Jordaan is also host to a number of local attractions, markets, museums, shops, restaurants and pubs. What is there to do on De Jordaan? The Anne Frank House – One of the most popular tourist spots in the area. You can visit the house that Anne Frank took refuge in during the World War II. Click on the link to find out more. Museums – There are quite a few museums around De Jordaan. The De Jordaan Museum is dedicated to the area and its artists. The Theo Thijssen Museum is dedicated to a local writer, teacher and unionist. There is even a Houseboat Museum. Living in canal barges is a large way of life in Amsterdam, there are a few of these dotted around the city. Markets – De Jordaan has a a couple of markets that run throughout the year. On a Saturday you will find the Lindenmarkt on the Lindengracht. On a Monday its flea market day at the Noordmarkt. Restaurants – There are many restaurants in De Jordaan serving up culinary treats from all over the world. You can find whatever you fancy, Japanese, Chinese, Indian, Thai, Mexican, Dutch, German, French and the UK all have nice places to eat with menus waiting to pull you in. Click here for a list of restaurants in the De Jordaan area.